This is a revised version of a “From the Local History Room” column that first appeared in May 2015 before the launch of this weblog, republished here as a part of our Illinois Bicentennial Series on early Illinois history. This week we’ll take a closer look at the form and expression of religious faith during Pekin’s earliest times, spotlighting the origin of Pekin’s first Methodist Christians. While the first European settlers to come to Tazewell County were Catholic Christians, following the establishment in 1824 of the settlement that would become Pekin, Methodism was the first religion to formally establish its presence among Pekin’s pioneer settlers. Pekin’s “first family,” the Tharps, had become Methodists before leaving Ohio for Illinois. As we have noted before, Pekin’s first preaching service took place in 1826, when Jacob Tharp invited Rev. Jesse Walker, a Methodist circuit-rider, to preach in Tharp’s log cabin. In his 1879 “History of Tazewell County,” pages 580-594, Charles C. Chapman provides an account of the history and progress of religion in Pekin, beginning with Rev. Walker’s preaching service. After Walker, a certain Rev. Lord ministered to Pekin’s first settlers. It was in 1827 that the first Methodist society, consisting of about eight or 10 members, was formed in Pekin by Smith L. Robinson. After Lord, Rev. John Sinclair arrived in 1831. Sinclair and Rev. Zadock Hall formally organized a Methodist Episcopal Church in Pekin, and Hall in turn was succeeded in 1834 by the church’s first regular installed minister, Rev. John Thomas Mitchell (1810-1863), a 24-year-old deacon who was active throughout northern and central Illinois. 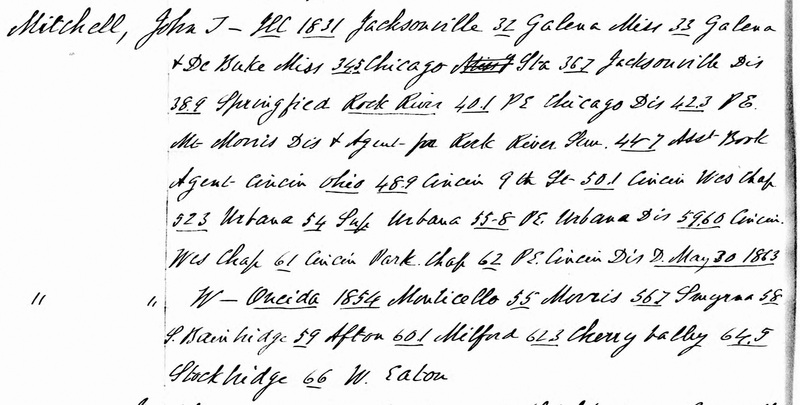 In this detail from a page of 1831 Methodist Church records chronicles that year’s ministerial activities of Rev. John T. Mitchell in Illinois. In 1834, Mitchell became the first regular installed minister of the Methodist church in Pekin. The following excerpts from Chapman’s account provide some colorful anecdotes from Mitchell’s time as Pekin’s Methodist minister. “The Rev. John T. Mitchell followed Rev. Hall. He was a man of great power and eloquence, and eccentric to a great degree. His flights of oratory at times were truly sublime. He began his labors as the first regular installed minister, in 1834, in a little room, about twenty feet square, in the old barracks or stockades, which stood on the ground now occupied by the old frame residence of Joshua Wagenseller. . . .
“We will give one or two illustrations which, in themselves, will speak for the plain-tongued man of God, John T. Mitchell. One of his congregation, and a widow, who had but recently laid off her weeds, sold a cow and purchased what in those days was termed an elegant cloak, and she disposed of a brass preserving kettle and bought a bonnet (we presume a love of a one). This piece of wholesale extravagance had gone the rounds of the village, and loud were the censures for this wanton outlay, when to wear a bow or an artificial flower was equivilent (sic) to receiving sentence with the damned. “Well, one Sunday morning when Father Mitchell was coming down on the pomps and vanities of the world, and earnestly hoping that none of his congregation would be guilty of putting on the flippery and flummery as worn by the worldings, just as his eloquence waxed warm on the subject of dress, in walked the widow with her new clothes, whereupon the sight of her was too much for him, and he said (pointing his finger directly at her,) ‘Yes, and there comes a woman with her cow upon her back and her brass kettle on her head.’ . . .
“In those days all the excitement the populace had, by way of breaking the monotony, was the landing of the steam-boats, and we are told that more always came on Sunday than any other day. Father Mitchell was exceedingly annoyed, from time to time, by many of his congregation jumping up and running to the river every time a boat whistled. Once, when the stampede began, Father Mitchell, with voice raised in tones of thunder, cried after them, ‘The wicked fleeth when no man pursueth.’ Whereupon a waggish fellow turned in the doorway, hat in hand, and, looking calmly at the divine, answered back, ‘and the righteous are as bold as a lion.’ . . .